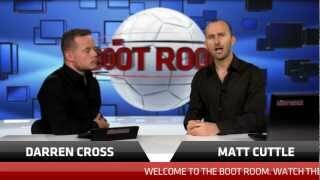 Darren Cross from Match Magazine and Matt Cuttle talk penalties and formations. Darren’s quick tips are when taking penalties, always choose a player on the pitch with the highest ‘PEN’ rating and his preferred formation is 4-4-2 diamond wide, also known as 4-1-2-1-2 in FIFA Ultimate Team. Join Darren and Matt next week for more FIFA 13 tips on some effective skills.